Topic we will be researching in this article is regarding medical malpractice cases that occur in hospitals. Hospitals are corporations responsible for providing the best possible med care to their customers. It often occurs that due to negligence of staff members the patients have to suffer damage, disability or in extreme cases death. It is the responsibility of hospital management to keep an eye on their staff and apply certain disciplinary action. It has been noted that in recent times the occurrence of these unfortunate incidents have increased greatly. Due to these events there has also been an increase in cases relating to malpractice cases in which usually the hospital is being sued along with the medical practitioner. Purpose of this research is to highlight the reasons due to which these cases occur and what methods can be applied to control the increase of these cases. For this purpose, data has been gathered from fifty individuals who have been part of such malpractice cases. This data was then processed in order to analyze the results. It was found from this study that it is indeed the responsibility of management to keep an eye on such cases and look for more competent staff. Hospital in which the incident occurred is Emirates hospital often names as Dubai hospital located in Dubai. It is an internationally recognized hospital said to be 100 bed beacon oh progress. It aims at providing personalized real time health care solutions. Located at Jumeriah Beach along with the Dubai Canal. Decision to form this hospital started in 1977, however its operations started after March 1983. Building consists of 14 stories out of which first two are for emergency and accidents. A school teacher went to get operated for a dislocated shoulder which the doctors said would require an operation. However, after the operation, same issue occurred again on which doctors advised another surgery. After undergoing numerous surgeries, her problem still remained while the doctors kept on suggesting surgeries. Tired of the doctor’s behavior, she filed a case against the emirates hospital demanding that she be compensated and these negligent doctors be checked. Hospitals should implement more transparency in their operations and take up a sincerer approach in understanding the community. These strategies will also serve to assist in looking up other social issues and improve image among the public. It has been seen that the private sector makes up greater portion of the industry and hence contribute more to global development. These measurements are not limited to economic issues but also engulfs effort from both society and environment. Medical organizations which are failing to implement social aspect in their corporate structure risk denial from the society without which it is not possible for the hospital to carry out its operations in a sustainable manner. Most crucial threats which an organization faces regarding this matter is reputation risk. Patients of a single medical institution is not limited by this threat but might adversely affect the whole industry. Affects can be understood that reputational crisis leads to loss of trust in medical institutions, patient loyalty along with extra charges that incur with legal actions. Damaged reputation not only takes years to rebuild but also requires extra funding. Such organizations are not only the choice of customers but also provide attractive workplace for employees due to which they can retain quality staff with more expertise. This advantage can be utilized in various hospital functions such as development. Investors not only look at financial data while making investment but also check the social image of the institution before making the final call. Hospitals holding a bad reputation are more less likely to receive grants and donors as compared to socially responsible hospitals. Malpractices in hospitals occur every day and it is not a new thing. Incident that occurred in this hospital which brought attention to this case is when a school teacher went to get operated for a dislocated shoulder which the doctors said would require an operation. However after the operation, same issue occurred again on which doctors advised another surgery. After undergoing numerous surgeries, her problem still remained while the doctors kept on suggesting surgeries. Tired of the doctor’s behavior, she filed a case against the emirates hospital demanding that she be compensated and these negligent doctors be checked. Sometimes the victim of such incidents recovers but some may end permanent harm which may result in disability or even death. Such actions need to be carefully examined by the board of the hospital and proper disciplinary action be taken to prevent these tasks from repeating themselves in the future. Often these malpractices may lead to law suits which ultimately damage the name of the hospital and involve heavy penalties. This negligence may be due to actions of doctors, paramedics, nurses, nursing assistants, technicians etc. In this research, researcher is focusing on social responsibility factor of medical institutions. Region of United Arab Emirates will be studied in this case. Cause for choosing this study is the medical malpractice case that occurred in emirates hospital in Dubai. Such cases show that the lack of social responsibility present in medical institutions such as hospitals, and the role of management in rectifying these issues is still at question here. Due to this there is a dire need to find out ways through which such events can be reduced, and these institutes demonstrate more social responsibility. Also, the causes behind such unfortunate incidents and what factors lead to these events. If the main root of the problem is identified and steps be taken to better understand it, then this problem can be minimized. Challenges and risk that medical sector must face due these issues will be mentioned. If a remedy is found, then this will be saving medical institutes a lot of expense which they faced in rewards for litigation cases and insurance purchased for malpractice. It is necessary to outline the main cause for which the research is being carried out so that a more goal-oriented method can be applied. Following are the objectives which we hope to achieve through this study. It is the role of medical practitioners to carry out their work with utmost care and responsibility as the life of patients is in their hands. Similarly, hospitals need to mold their organizational structure in such a way that check is kept on responsibility of doctors and they are answerable. Medical malpractice is a legal cause of action that occurs when a medical or health care professional deviates from standards in his or her profession, thereby causing injury to a patient. Failure to diagnose or misdiagnosis. In this portion of the article we will be discussing the various research approaches, design, strategy and data collection methods that can be applied to gather information regarding medical malpractice cases that occur in hospitals and how patients claim against these practices. Methodology can simply be defined as the method of doing something. Using this term from research perspective, we can say that it is the outline on which research will be conducted. Many decisions are to be taken while making the outline of methodology which varies from one type of research to the other and totally depends on the conditions. Major decisions that have to be made are relating to the design, approach, strategy and method applied for the collection of data. Type of research which is being taken in this report is quantitative. This will provide a better understanding with numerical figures showing how people feel about malpractice cases and what were the response of victims. Qualitative analysis would not give an understanding as clear as that given by quantitative analysis. First hand data will make it more reliable and more related to local medical environment of UAE. In designing the pathway for research, it is also necessary to mention which sources will be used for data collection. Method used varies from the type of research being undertaken. 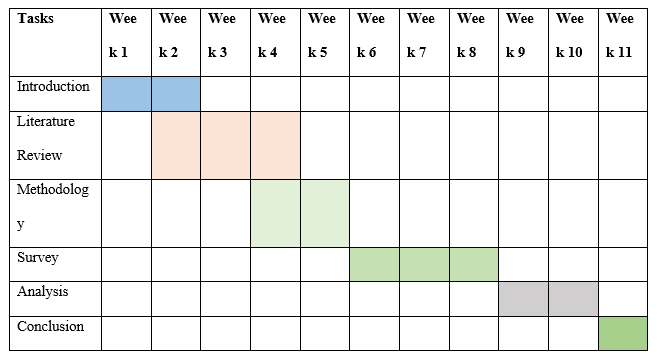 Main methods of collecting data includes primary. Method of collecting data used is primary data where information will be gathered by the use of questionnaire. Questionnaire will be compromising of two sections in which one will contain personal data about the participant while second will contain questions regarding the problem at hand. Data will be gathered from patients of the hospital who feel that proper treatment was not properly given to them or they feel like a victim of medical malpractice. Although this would be hard to find the candidates needed. Researcher can take help from previous cases of such incidents which occurred in the hospital. Data shall be gathered from around hundred people. The sampling technique which has been adopted here is the non-probability sampling. Under the non-probability sampling techniques, the convenient sampling has been chosen. This sampling is most suitable for the study. Under this sampling technique the data will only be collected from those of the respondents who are willing to fill the data. There is the possibility that at the time when the questionnaire will be distributed among the respondents some of them may have to do their task and they cannot fill the data at the spot. Since the people under survey are patients therefore extra care has to be taken to keep them uncomfortable. Therefore, it is not necessary that data should be taken on the spot but can also be collected through electronic media by mailing the survey to the client so that he may solve it whenever he wishes. While undergoing such research it is necessary that some ethical principles be kept in mind. Researcher should keep in mind that participants of the survey are actually victims which have undergone discomfort due to negligence and their feelings be kept in mind. No such question shall be asked which may invoke certain emotions in the mind of the participant. Furthermore, no harm should reach the participants in any way due to this survey. Dignity of the participants will be prioritized. Purpose for which the survey is being conducted should be communicated along with ensuring them that privacy will be maintained. There is the possibility that at the time when the questionnaire will be distributed among the respondents some of them may have to do their task and they cannot fill the data at the spot. Since the people under survey are patients therefore extra care has to be taken to keep them uncomfortable. Therefore, it is not necessary that data should be taken on the spot but can also be collected through electronic media by mailing the survey to the client so that he may solve it whenever he wishes Data gathered in the survey will be confidential and only used for research purposes. Since the patients may also be suffering from emotional harm, there is a chance that biasness will be present in the data. 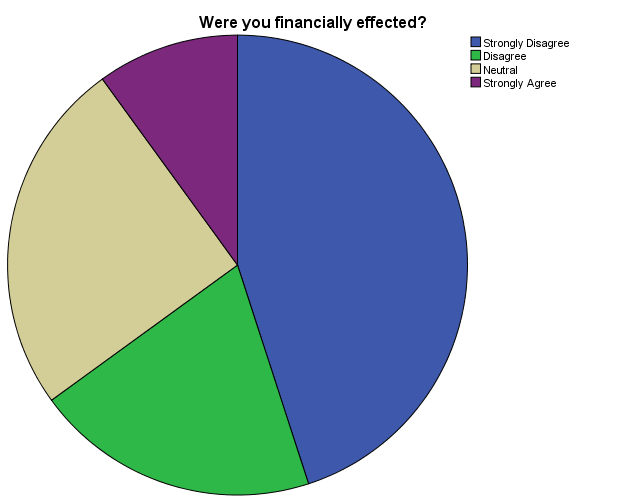 In the start of the survey participants should be informed of the importance this survey carries and what effects it could have if data is not honestly filled. 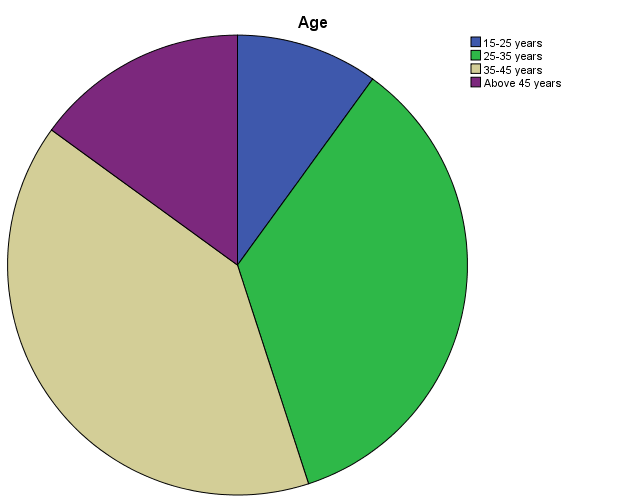 Majority of our respondents lie within the age of 25 to 45 years as around 75% or respondents were found to be in that age range. 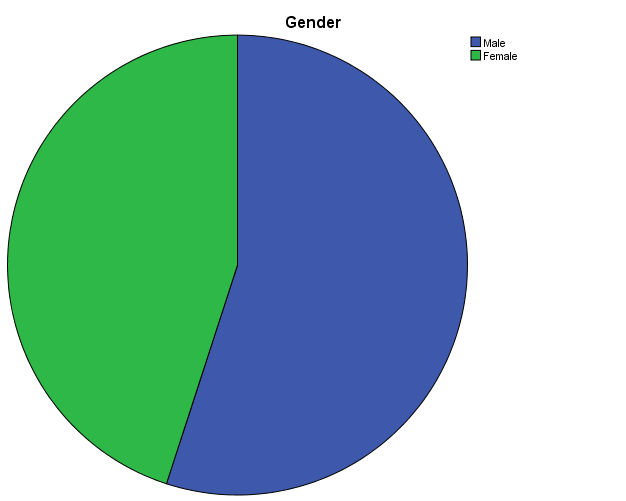 Number of males in the survey taken were found to be greater as out of the hundred participants around 55 were male and 45 were female. All the participants belonged to the region of United Arab Emirates. Do you always visit the same doctor? 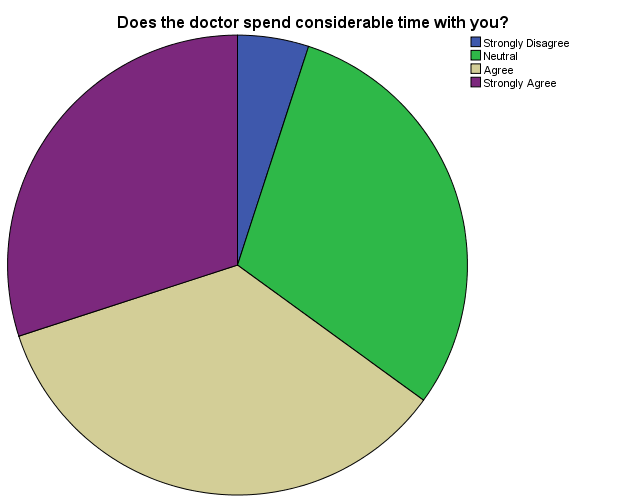 Does the doctor spend considerable time with you? Second question was regarding whether the medical practitioner spent considerable amount of time with the patient to properly diagnose it. 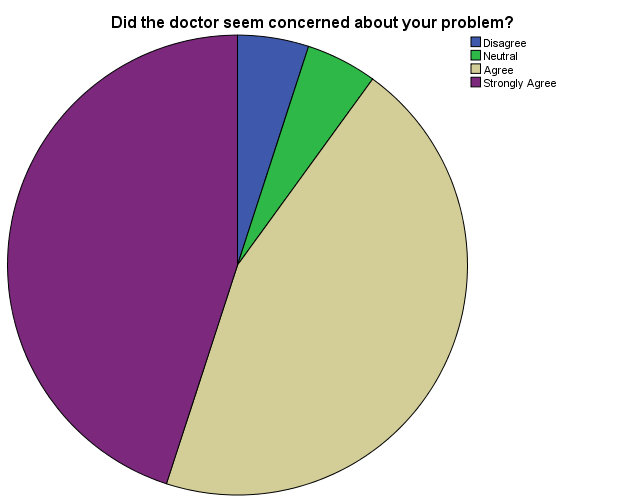 Around 65% of the participants felt that the doctor gave appropriate time to their diagnosis out of which 30% strongly agreed. 30% of participants had a neutral view while only 10% disagreed. It can be said from this data that most doctors give appropriate time to their patients. Did the doctor properly inform you about your disease? This question aims to show that do doctors properly inform employees about their disease so they can better understand their problem. Here around 65% people disagreed out of which around 30% strongly disagreed. Only 5% participant had a neutral view. Form this we can say that most doctors either fail to properly inform their clients about their disease or simply choose to not inform them. 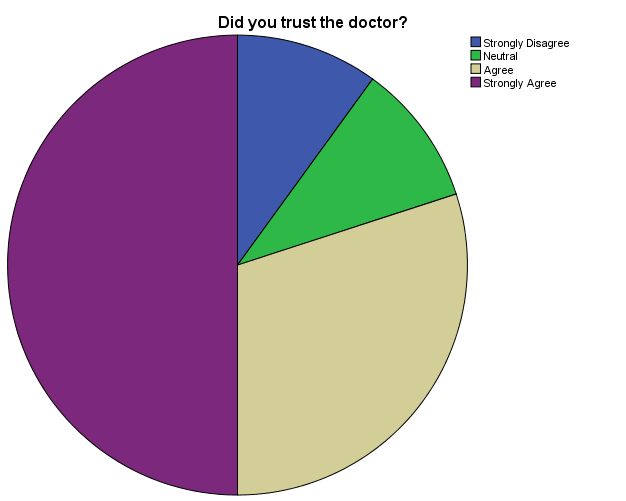 Did you trust the doctor? This questions aims to see how patients feel towards their doctor as they put their health into their hands. 30% of the participants agreed with this statement out of which 50% individuals strongly agreed. 10% of participants had a neutral view while 10% disagreed with this statement. 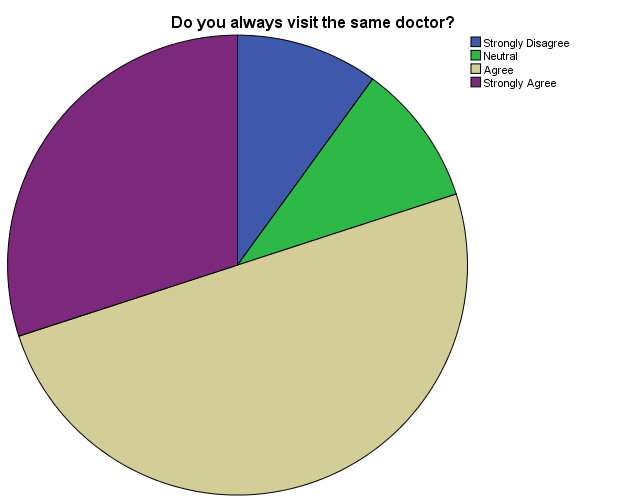 We can say from this data that most patients place their faith in the doctor’s diagnosis. 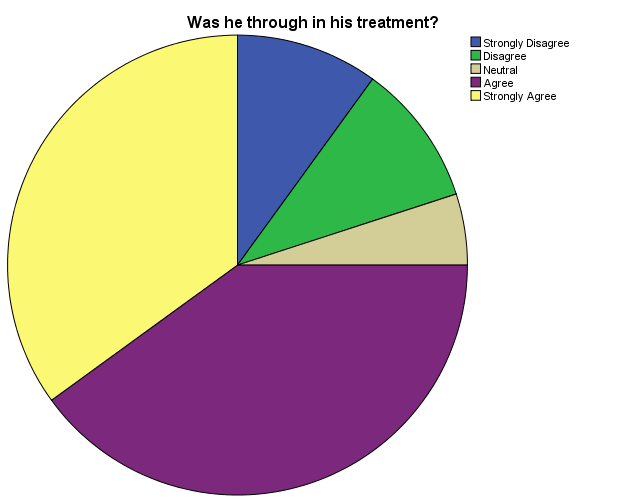 Was he thorough in his treatment? Aim of this question is to see whether the doctor properly went through the details of the problem and then made his diagnosis. Around 75% of participants said that they agreed that their doctor properly checked them while one person was neutral and 20% showed a negative response. From this we can say that most doctors properly go through the details of a disease before its diagnosis. Did he explain your options? In a treatment there are usually a number of treatments from which the doctor can opt from and each aspect has its own benefits and drawbacks. Data taken showed that only 40% of participants felt that their doctor properly explained them about the options available while 20 % were neutral and 40 % showed a negative response. This gives us with a balanced view point but we can say that half of the time doctors try to explain their diagnosis. Were you informed about the risks involved? In much medical diagnosis there are situations where patients are exposed to certain side effects or risks. It is the duty of doctor to inform patients about them. 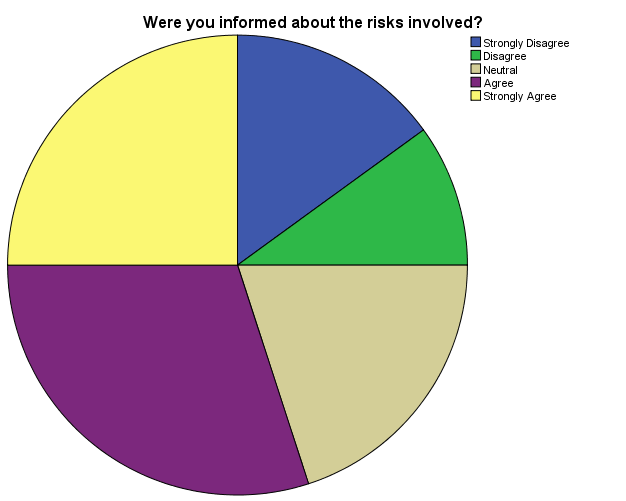 55% of participants say that they were informed about the risk involved in diagnosis while 20% had a neutral view. 25% participants disagreed out of which around 15% strongly disagreed. Did the doctor seem concerned about your problem? This questions aims to see what level of emotional care and sympathy was exhibited by the doctor. 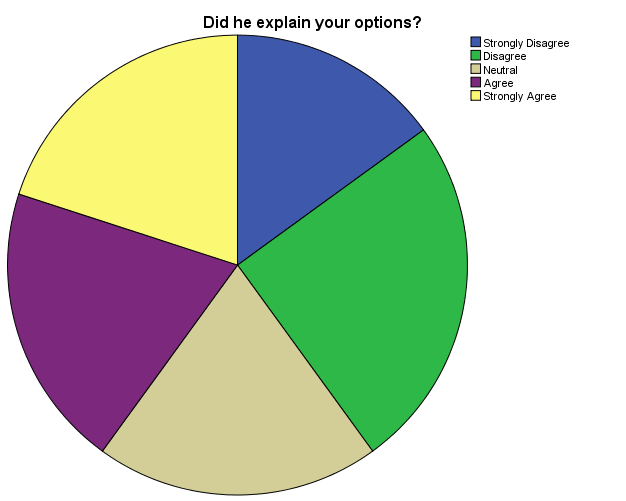 Around 90% of participants agreed with this while one participant had a neutral view and one disagreed. From this we can say that doctors give proper time to their patients and properly listen to them. 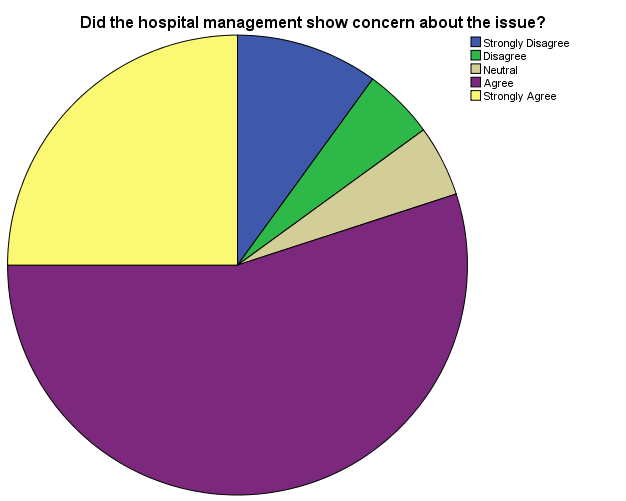 Did the hospital management show concern about the issue? When some issue arises with the diagnosis then the hospital authority needs to informed about the case so they can take appropriate action. This questions aims to see whether the management showed concern about the issue. Around 80% of participants agreed out of which 25% participants strongly agreed. 5% of participants were neutral while 15% of participants disagreed. Do you feel that the incident could have been avoided? It is to see that whether the case that occurred could have been avoided by exhibiting more caution. Around 15% of the participants agreed. 30% of the participants were neutral while 55% disagreed out of which 40% strongly disagreed. 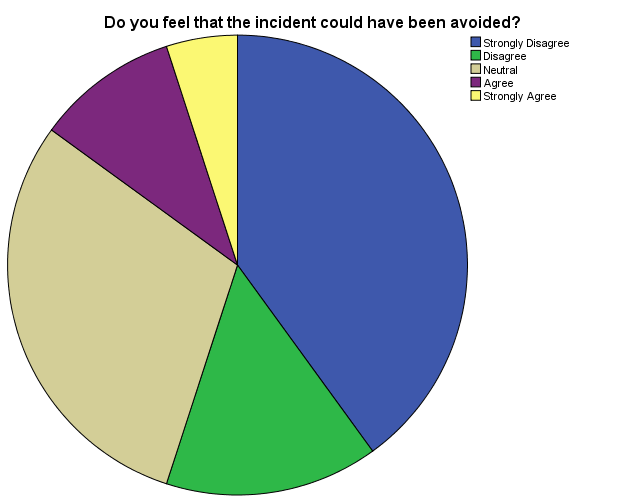 This shows that most patients believe the scenario was unavoidable even if caution was taken. This question was aimed to see the financial impact of the incident on the patient. 10% of participants strongly agreed while 25 % had a neutral view. 65% of participants disagreed out of which 45% strongly disagreed. From this we can say that most participants did not face financial problem with the incident. Misdiagnosis of disease can lead to physical harm. 10% of participants agreed that they were physically harmed while 30% had a neural view. 25% of participants agreed and 35% strongly disagreed. We can say that misdiagnosis did not cause physical harm in most cases. Did the incident cause emotional damage? Emotional impact of misdiagnosis can be severe as the patient feels helpless and at the mercy of the medication. 10% of participants strongly agreed while15% agreed with it. 5% of participants had a neutral view while 55% disagreed and 15% strongly disagreed. 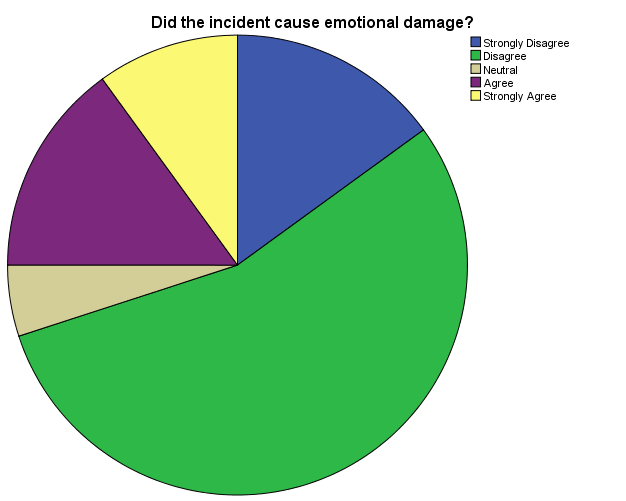 This data shows that most participants did not face emotional damage. Would you still trust a medical practitioner? Despite the incident, would the patient still be able to place his trust in medical practitioners. 40% strongly agreed with this statement, 30% agsreed and around 20% had a neutral view. 5% disagreed while 5% person strongly disagreed. 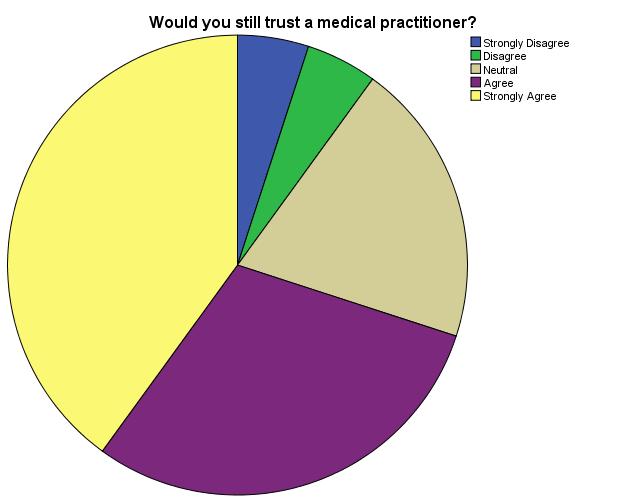 Therefore, we can say that most people would still trust his medical practitioner. Aim of this article was to study the cases of medical malpractice and find the reasons behind the malpractice cases that occur nowadays. Finding the main reasons behind it will help reduce the occurrence of such cases. Some results gathered from this research are following; Most people visit the same doctor, Doctors fairly spend proper time with patients Most doctors fail to properly inform patients about the disease, Majority of patients place their trust in their doctors, Doctors tend to thoroughly examine their patients, Options of treatment are usually not explained, Risk involved are not always communicated, Most doctors are concerned about patients, Majority of patients believe that the misdiagnosis could not have been avoided, Physical harm did not usually occur in such cases, Emotional damage was not common, Most people would still trust their medical practitioner. From this data we can say that patients know the sensitivity of diagnosing diseases and the complications that can arise with it. Doctors should make greater effort in explaining the problem which patients have and present them options of diagnosis from which they can choose from. Further on the risk involved in such cases should be better communicated to the patients. Role of the hospital management should also be brought forward in this matter as it has been seen in some cases that liability of the incident was dumped on the accused practitioner who didn’t have support from the society either. Effective way to communicate the data of this plans, in order to inform the feelings of patients towards these cases, is by organizing workshops at different medical institutions especially hospitals. If dynamics of such cases have been explained to medical students then it would be easier for them to have a better idea about it from the start so that they are more careful in their professional life. They will be taught the importance the importance of informing patients about the nature of their problem along with risks that carry with it so they have a better understanding. Brennan, T.A., 2004. Medical malpractice. The New England Journal of Medicine, 350(3), p.283. Epstein, R.A., 2006. Medical malpractice: the case for contract. Law & Social Inquiry, 1(1), pp.87-150. Danzon, P.M., 2004. The frequency and severity of medical malpractice claims: new evidence. Law and Contemporary Problems, 49(2), pp.57-84. McMichael, B.J., Van Horn, R.L. and Viscusi, W.K., 2016. Sorry is Never Enough: The Effect of State Apology Laws on Medical Malpractice Liability Risk. Seidelson, D.E., 1966. Medical Malpractice Cases and the Reluctant Expert. Cath. UL Rev., 16, p.158. McWilliams, A., 2000. Corporate social responsibility. Wiley Encyclopedia of Management. Baker, T., 2011. The medical malpractice myth. ReadHowYouWant. com. Was he through in his treatment?